Yesterday, February 10th marked the 78th anniversary of regularly scheduled electric powered passenger trains running between New York City and Wahshington DC, a result of the Pennsylvania Railroad’s effort to electrify the main line system throughout the congested Northeast region. Formerly known as Germantown Junction, North Philadelphia marked where the 1918 electrification of the Chestnut Hill Branch diverged from the main line to head north into the suburbs. This junction today sees Septa trains diverging on the same route while handling the north - south traffic of the Northeast Corridor. 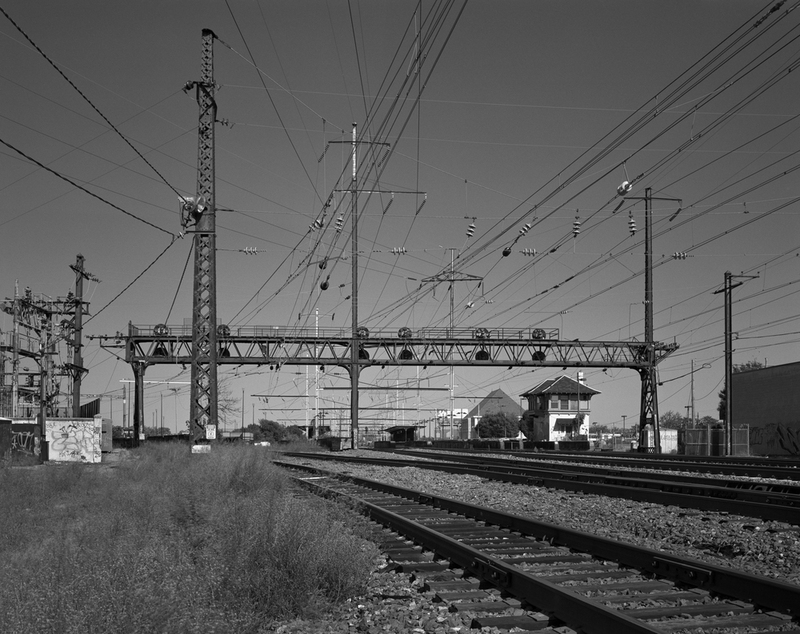 Note the massive signal bridge which originally spanned up to 8 tracks, and the early lattice style catenary pole in the foreground. The Pennsylvania Railroad’s electrification projects date back as early as 1895 when the railroad used the Burlington and Mt. Holly Railroad as a test subject for a 7 mile 500 volt DC trolley system. The experiment lasted just six years when the Mt Holly powerhouse caught fire. In 1906 southern New Jersey subsidiary West Jersey & Seashore Railroad, built a third rail 600 volt DC system from Camden to Millville and Atlantic City via Newfield. Like an interurban or trolley system the line utilized overhead wire in congested areas like Camden but also had several installations in the countryside, as way to test the durability of trolley wire versus third rail at higher speeds. The same year the PRR installed yet another 600 volt DC system on a short Cumberland Valley Railroad branch running 7.7 miles from Mechanicsburg and Dillsburg all predecessors to the first large scale use of this technology on the railroad. In 1910, the PRR would construct a similar 650-volt DC system to operate the newly opened New York Terminal. Running from Manhattan Transfer near Harrison, New Jersey east to the beautiful Penn Station and ultimately to the sprawling Sunnyside Yard in Queens. 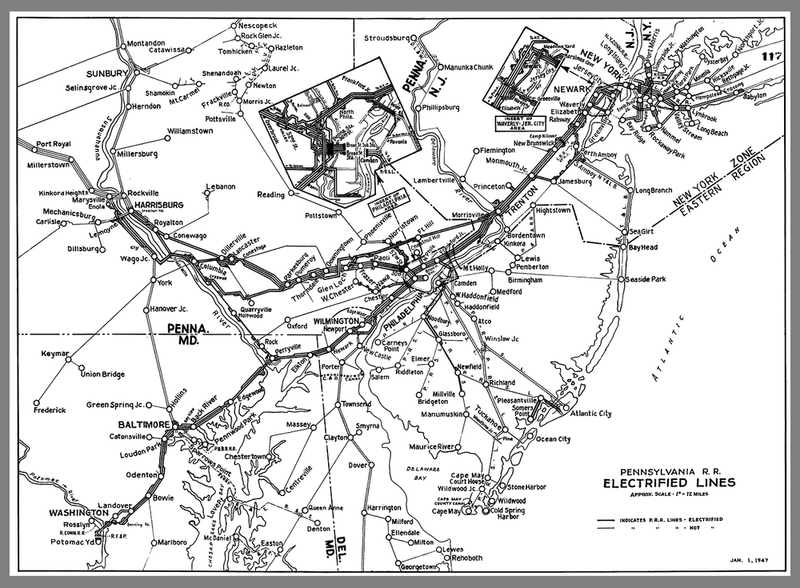 Map detailing the Pennsylvania Railroad's electrified territory circa 1947. Collection of Rails and Trails. Soon after the benefits of electric traction were realize in the New York Terminal, attention was focused on the Philadelphia area to relieve congestion, in particular operations radiating from the stub-end Broad Street Station complex. After considerable research the railroad adopted the use of high voltage alternating current for this and all future projects like that of its northern neighbor the New Haven who began use of this technology as early as 1907. Initial electrification included the district between Broad Street and Paoli on the Main Line, which was completed in 1915, followed by the Chestnut Hill Branch in 1918, and the White Marsh Branch in 1924. Expansion continued south to Wilmington on the main line including the branch to West Chester in 1928 and north on the main line to Trenton and the Schuylkill Valley Branch to Norristown in 1930 thus completing the electrification of Philadelphia region suburban lines. Subsequent studies indicated an economical advantage of electrification outside the commuter zones for regional and long distance trains between New York, Philadelphia, Washington DC and Harrisburg, prompting Pennsylvania Railroad President William Wallace Atterbury to close the gaps in electrification beginning late in 1928. Despite the Great Depression the electrification project continued through 1933, completing the retrofit of the New York Terminal for AC traction and finishing catenary work to complete the network to Wilmington and Paoli. The PRR electrified network still serves the modern needs of Amtrak, providing propulsion for Acela, regional and local passenger rail service through out the Northeast. At Shore, on the Northeast Corridor a southbound passes as another northbound region approaches. Note the catenary above the void in front of the camera, this is where the line to Delair diverges and used to have multiple tracks, all electrified into Pavonia Yard in Camden. Understanding that Wilmington would not be a suitable southern terminal for electrification, catenary was extended to Washington DC including Potomac Yard, financed by a 70 million dollar loan secured from depression era federal recovery programs. Beginning in January of 1934, various reports say up to 20,000 men went to work, comprising of furloughed railroad employees and new hires in the electrical / construction trades to complete the electrification of the New York – Washington DC main line, which opened for business on February 10th 1935. As a result of the success on the north south “corridor” the PRR sought to complete electrification from the eastern seaboard west to the Harrisburg terminal including all associated freight and passenger main lines. Work commenced on the Low Grade from Morrisville to Enola, the main line from Paoli to Harrisburg and the on the Columbia Branch and Columbia & Port Deposit. Completed in 1938 the entire electrification created a powerful conduit that put the railroad in an excellent position to handle the impending pressure of war time traffic demands. The Harrisburg power Dispatchers office, which was slated to close the beginning of this month controlled the electrical supply network for both signal and catenary systems. This massive installation is an engineering marvel by itself, an impressive monitor and control system consisting of hundreds of push button breakers and miles of wiring. 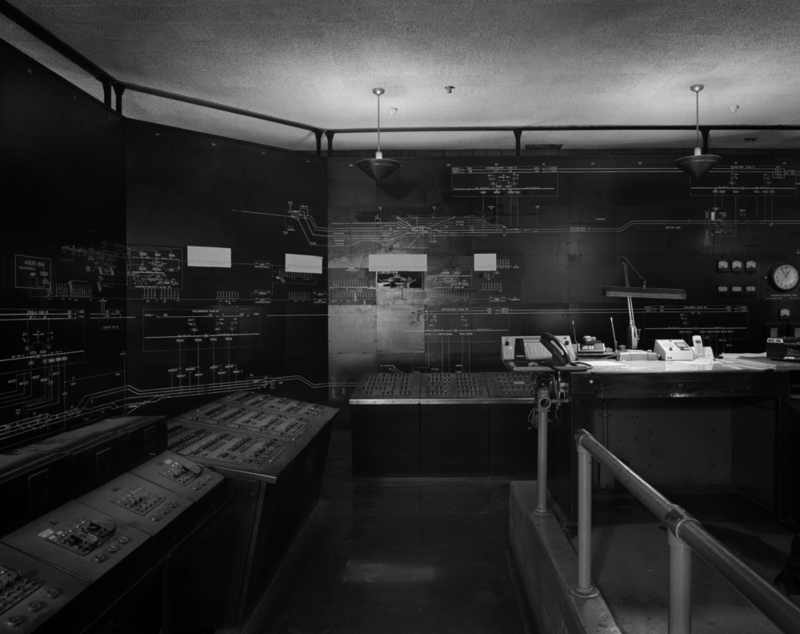 Though this facility remained in service, the actual console was taken off line and replaced by computers which were located out of view. The electrified infrastructure has remained visibly the same over the ensuing decades, surviving the Pennsylvania Railroad, Penn Central, Conrail and Amtrak. Though Conrail abandoned the electrified freight service in the 1980's Amtrak continues to maintain and modify where needed the original fixed tension catenary system. With the implementation of CTEC, its centralized traffic and electrical dispatching center, the company has slowly decommissioned all the former PRR power dispatching facilities in favor of new computerized systems. Today, when you ride the Northeast Corridor, look at the details amongst this great infrastructure, they reveal the various phases of construction and symbolize the ingenuity and engineering ability of the great Pennsylvania Railroad.